We’d love your help. Let us know what’s wrong with this preview of Reaper by Doug Richardson. 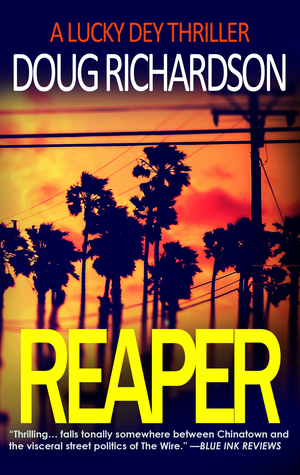 To ask other readers questions about Reaper, please sign up. Doug Richardson cut his teeth writing movies like DIE HARD 2, BAD BOYS, and HOSTAGE. But scratch the surface and discover he thinks there’s a killer inside all of us. His Lucky Dey books exist between the gutter and the glitter of a morally suspect landscape he calls Luckyland—aka Los Angeles—the city of Doug’s birth and where he lives with his wife, two children, four big mutts, and the dead body he’s still semi-convinced is buried in his San Fernando Valley back yard. …once tail-hooked onto aircraft carrier U.S.S. Nimitz with a Bond Girl. …dove for sunken treasure off the coast of Cuba (before travelling to Cuba was cool). …miraculously hit scratch at age 50 after a lifetime of playing golf. …was born and raised in politics, which is why he understands it… and thoroughly loathes it. …routinely embarrasses his children by crying at the movies. …finds pleasure in scotch. Blended or single malt. Rocks. Even better with a cigar. …talked his way into Ronald Reagan’s office to get a fistful of jellybeans at age ten.